Windows 8 Developer account verified at last! As you may know, Flashdeck for Windows 8 was supposed to in the Win8 Store before general availability, however I had a setback. Your account must be verified before any apps can be submitted for verification. When ever I tried to do this it gave me an error “We can’t connect to the service. Please try again later”. I have been onto Microsoft support about the issue and I can say they were very helpful and responses were quick (unlike other support services… EA I’m looking at you ಠ_ಠ ). Apparently it was a known fault and was being fixed. 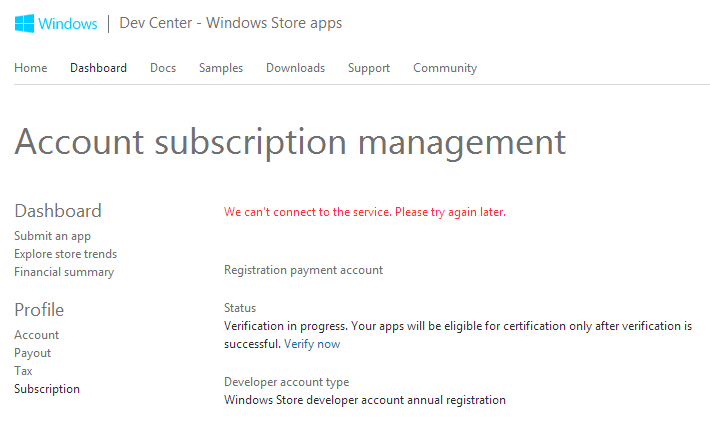 It took them a few weeks (seems a long time to me) but it has finally been addressed and I can now submit apps to the Windows 8 Store. I have canceled the previous submission of Flashdeck as I wasn’t happy with the file system in-place. I believe I have found a solution and will try to implement it in the coming days but I have a lot of Uni work to do as well still.